According to the Girl Scout Research Institute study Having It All: Girls and Financial Literacy, girls know they need a solid financial foundation, but few feel confident about their skills. 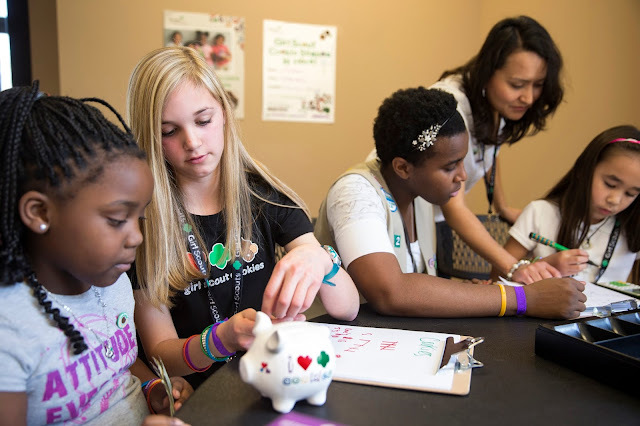 Girl Scouts and Toyota Financial Services (TFS) are changing that, through a multiyear partnership developed to help girls become self-reliant, financially informed, and capable of leveraging their talent and business values to make the world a better place. Thanks to the partnership, every Girl Scout Junior, Cadette, Senior, and Ambassador can take part in financial-planning activities that let them practice real-life scenarios, like saving for college and building good credit—important stuff! One way Girl Scouts and TFS are preparing girls to take charge of their financial education and future is with the TFS "Driving My Financial Future" Tip Sheet—a key resource to help Girl Scouts further strengthen the skills they hone when they earn Financial Literacy badges. These badges can be earned throughout the year and target such practical situations as setting up a budget and engaging in philanthropy. Efforts like this one build young women’s financial literacy, empowering them for a successful future—tomorrow and in the decades to come. So what are you waiting for? Accelerate your girl’s future with our awesome Tip Sheet!